LEARN HOW TO CONTROL DIABETES WITH HYPNOSIS!!! Dr. Steve G. Jones M.Ed. 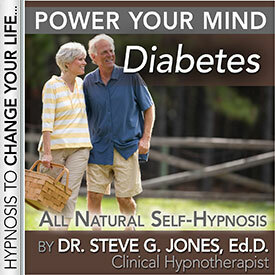 is proud to offer this effective method of hypnosis therapy for controlling Diabetes. Improve your life with this CD or MP3 NOW!!! It is very important for people diagnosed with diabetes to lead an active and healthy lifestyle. People with diabetes should keep track of their carbohydrate, fat, and protein intake, but most importantly their carbohydrate intake. Carbohydrates have a great impact on blood glucose levels in the body. It always important to eat a healthy diet. Exercise is another important factor for people with diabetes. Consistent physical activity helps regulate weight, blood pressure, cholesterol, reduces risk of heart disease, and lowers stress levels.